Aintree racecourse chiefs have hailed welfare improvements at the track after all runners returned safely at the three-day Grand National festival. For the second year running, there were no serious injuries in the National. And this year there were no equine fatalities from 332 runners in 21 races at the meeting. "They are extremely positive signs from two runnings of the National," the track's managing director John Baker told BBC Sport. "We won't get complacent but it was a great week for the festival and the Grand National. "I think we have put a line in the sand. There is certainly good reason for us to move forward." On Saturday, 25-1 shot Pineau De Re, trained by former GP Dr Richard Newland, won the 167th running of the famous steeplechase, which attracts an estimated global TV audience of 500 million people. 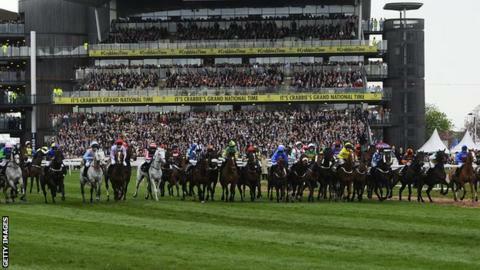 The race, for up to 40 runners over 30 fences and nearly four and a half miles, attracted criticism after two horses died in both the 2011 and 2012 editions. New softer plastic core fence structures were introduced for last year's contest, along with other measures aimed at improving safety, including reducing the race's distance by 90 yards. After a false start on Saturday in which an assistant starter was knocked down, although not badly hurt, the 39 jockeys who began the race later learned they would each face two-day bans for breaching rules by setting off too early. But the riders refused to attend a reconvened stewards' inquiry to hear the result and the issue will be dealt with by a British Horseracing Authority disciplinary panel later this month. Boos from sections of a sell-out 70,000 crowd greeted the false start, but Baker said it was tough to come up with a perfect system. "There's 40 jockeys vying for position. As much as you talk to them and say, 'stay calm at the start', once you get down there and it's the Grand National you can understand their anxiety to get away quickly," he said. "It's unfortunate, and not ideal. We're not always going to get a clean start." Baker was, however, cheered by the race itself in which Leighton Aspell - who quit race riding in 2007 only to return two years later - triumphed on the 11-year-old Pineau De Re. "It was a great story and I think it has put the National back on the map for all the right reasons," he said. "The last two years have shown we can provide a dramatic spectacle and look to reassure people about welfare. "You need a bit of luck in any horse race. You can never reduce the risk [entirely] but I think it was a tremendously exciting race this year. "The meeting had a feelgood factor from day one and, from our perspective, everything seemed to have gone like clockwork."